The founder of the Locus Initiative is a self–proclaimed smiler. 34th Street Magazine: What is the Locus Initiative? Benjamin Gargano: It’s a pledge–based platform built to connect and mobilize the next generation of givers. It’s very high level. So, the idea is, upon graduating, people will pledge to donate at least one percent of their working time, one percent of their income, or some combination, to a cause that resonates with them. Street: What made you want to start Locus? BG: I went abroad junior year, and when I got back, I kind of had this existential crisis during which I just didn’t really know what I wanted to do with my life, and I realized that while abroad, it had been a great experience for learning more about myself, but I didn’t feel like I was doing that much for others. I knew that for the next year and a half, I wanted to at least be somewhat involved in building something. I worked with about six other people to bring the idea to fruition and we’re still working on it today. 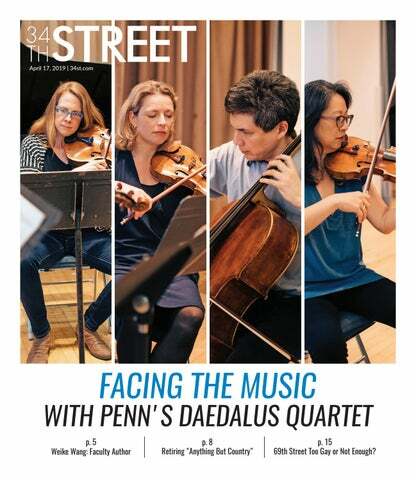 Street: How did your work with Locus affect the end of your Penn experience? BG: My senior year has definitely not been as relaxed as a lot of other people’s. I’m part–time, but even though I’m only in two classes, we’re really working hard at making it sustainable. Right now, we’re hiring two full–time people to run Locus next year because, out of the six co–founders, two are currently juniors at Penn and four of us are seniors who are going into other areas after graduation, so we can’t run the initiative full–time. So the hope is, we’ll find two people who are really willing to take it on and run it for next year. Street: Which movie best describes your personality? BG: I’d say Big. Tom Hanks. So basically, he’s a kid who turns into an adult overnight with some magical spell, and he just doesn’t yet know how to be an adult. He’s just bubbly and, sort of, still figuring things out. So that’s the way I sort of like to see myself. Street: What kind of music are you currently listening to? BG: I love classic rock. That’s sort of my foundation. I love The Beatles, The Who, the Stones, Bruce Springsteen. And then, as far as new music goes, I love Coldplay, I love Kanye, love Kendrick Lamar. Sorry this is a long list, but yeah. Street: What’s been your least favorite thing about Penn? BG: I’d say the silos that Penn has broken off into. Often times you hear about the importance of meeting new people and branching out in college, and I think it is a really important thing to do, but at a school like Penn, it’s hard to do that unless you actively chase it. I’ve tried to sort of extend an open arm to people outside of my immediate social scene and join clubs that allow me to do that, but it’s still tough. Street: What should every Penn student do before they graduate? BG: I’d say explore West Philly. I’d say there’s this notion that you can go to Center City, you can go to Old City, but it’s not necessarily as popular to go past 41st or 42nd Street, and see places that aren’t necessarily associated with the common notion of exploring Philly. But that area of Philly is so great, and so vibrant, and so interesting. There are so many great restaurants, so many great people you’ll meet. I did a program called Big Brothers Big Sisters and that’s a great way to go see what elementary schools, middle schools, high schools are like in that area. It’s a good opportunity to mentor kids who are from that area. I think it’s really important to see all sides of Philadelphia from Center City to Old City to West Philly. And West Philly is often times, from what I hear, the area that people decide to sort of explore last, and I think it’s really, really important that by the end of people’s college careers, they make an effort to go. Street: If you could meet any fictional character, who would you meet and what would you do? BG: That’s a tough one. Huck Finn. This sort of goes back to the notion of the movie Big. I think he’s just a kid who has a really good heart and is really playful, so we’d probably just play sports together, or adventure together, and sort of explore different areas. Street: Favorite memory from college? BG: One of the things I’ve loved the most about Penn is how special the people you meet here are, and I’ve met some of the smartest, most dynamic, most interesting people in my lifetime in the last four years. So really, one of my most fond memories is just staying up until 3:30 a.m. just discussing life with all these people from different backgrounds, sort of people’s takes on everything, from what you want to do in five years to what do you think the meaning of life is. We got really deep and broad, but because the people you meet here are so interesting and so dynamic and so smart, you’ll get different perceptions and different perspectives from every person you meet, and it’s great to just dig in and have these deeper existential conversations with the people around you. Street: What’s been your wildest rooming situation? BG: My friends will probably tell you I’m not necessarily the neatest person in the world, so my sophomore roommate, who’s not a full–on neat freak or anything, but just like very organized, very clean. I went into that year basically leaving my clothes all over the place, definitely not the most respectful roommate in the world, and I was sort of transformed. That was probably my biggest change throughout college, going from someone who would leave their stuff everywhere to being, like, cleaner. I mean, now, I’ve kind of settled back into the old ways a little bit, now that I don’t have a roommate anymore, but he definitely kicked me into shape a little bit. We were great roommates. He’s one of my best friends, we’re on the same sleep schedule, there wasn’t anything that crazy other than that transition for me. Street: Favorite show right now? BG: Banana Whip from Hip City Veg. It’s a good one. BG: Those who smile at you on Locust and those who stare you down. BG: I try to be a smiler. I don't know what people would say. BG: gorgie455. So, my friends in fifth grade called me gorgie as a variation of Gargano and it stuck until 12th grade.